Mary Tabitha Jernigan (1842-aft. 1900) was the first born child of Rev. William Henry Jernigan and Dicey Moore. Her father was a farmer and served as a deacon and lay minister in the Methodist Episcopal Church South. 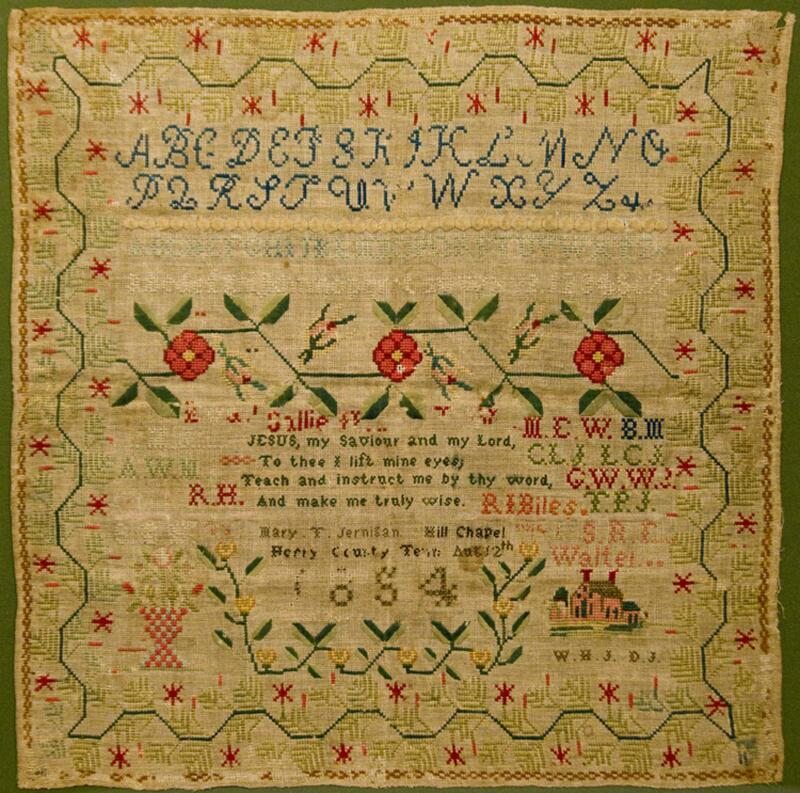 He may have preached at Hill Chapel as the name of the chapel is on Mary’s sampler. Perhaps she went to school there also, as many churches had schools associated with them. Sometime in the late 1850s the family moved to the Walnut Grove area in Independence Co., AR. Mary wed Capt. Samuel R. Fetzer in 1866. The couple had four children. Samuel was a farmer who worked part time at a store in Edwards, AR. The Captain died in 1885. Mary died sometime after 1900. She may be buried next to her husband in the Fetzer Cemetery near Newark, Independence Co., AR. 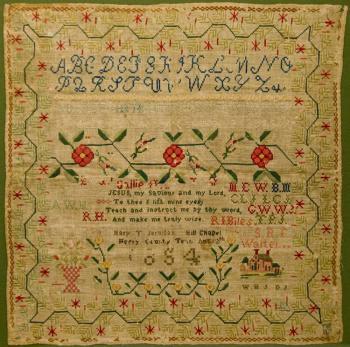 This colorful sampler contains a verse from Hymn 99, found in second edition of A Selection of Psalms and Hymns, for a Country Congregation. And make me truly wise.